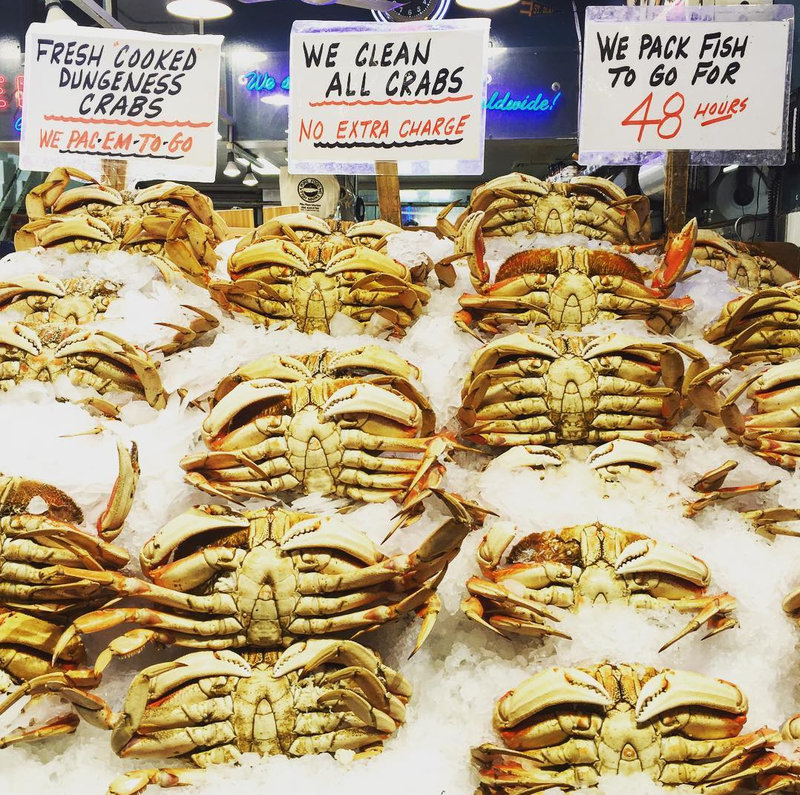 I just came back from a trip in Seattle where I spent the entire time stuffing my face with seafood. Sweet, delicious seafood. I was truly in heaven. 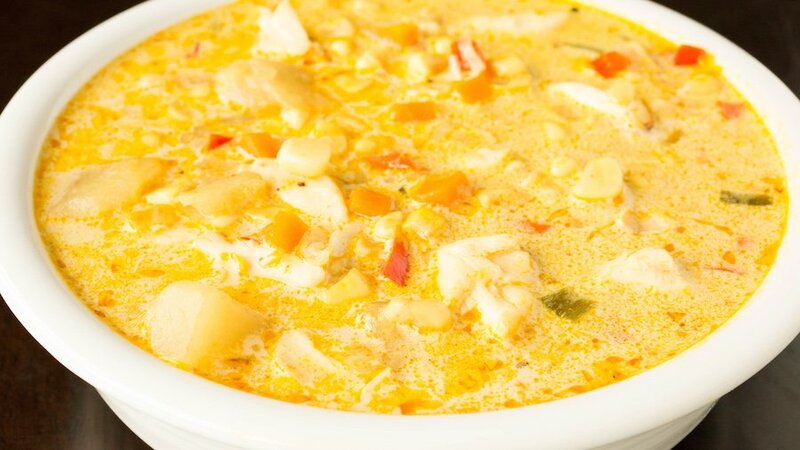 Now that I’m back in sunny LA, I’m really wishing I was sitting on a restaurant porch, on one of those typical dreary Pacific Northwest days, warming my soul with some savory crab chowder. Well I’m not oneto just dream about something, I do it. I can’t make it grey and rainy in LA, but I can make myself some delicious crab chowder. I don’t want to waste your time posting boring recipes, so I wanted to top it with something special. But what? If you’ve seen my Old Bay Nuts recipe you know it has a very special place in my heart. Who doesn’t like their crab with a little bit of Old Bay? The brain juices began flowing and I decided to make some mini Old Bay chips. Holy crustacean soup! This decision was more than right. 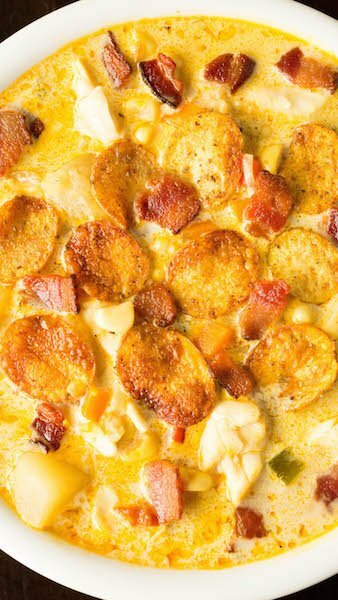 The Old Bay chips are the PERFECT topping for this chowder. The little bit of extra flavor they add complement the crab perfectly, without overwhelming it. I will be making these little crispy chips of tasty goodness every time I make chowder from here on out. Put the chopped bacon in the bottom of a medium stockpot. Cook over medium heat for about 5 minutes, until the bacon is crispy. Remove the bacon and place on a paper towel, leaving the bacon grease in the pot. Add the celery, carrots, and onion to the pot. Cook and stir often for about 5 minutes, until they are soft. Add the garlic and cook for 1 minute. Add the bell peppers and corn. Cook for 10 minutes, stirring often. Sprinkle in the flour. Stir constantly for 5 minutes. Pour in the stock. Whisk everything together, eliminating any lumps. Add the potato chunks and bring to a boil. Reduce to a simmer, cover, and cook for 20 minutes. 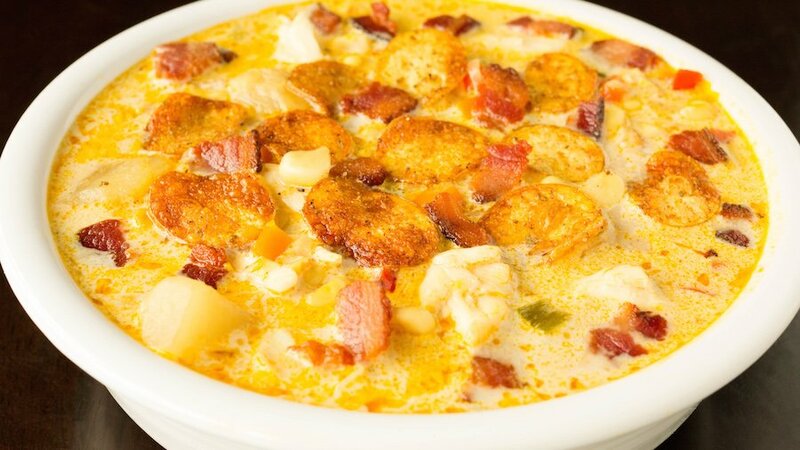 Season the chowder with the salt and cayenne. Add the cream and crab meat. Serve using the bacon and Old Bay chips as garnish. Heat the canola oil in your deep fryer. *If you don’t have a deep fryer, heat some oil in a skillet to 365°. Slice potatoes paper thin. It is best if you have a mandolin slicer, but if you do not you can do it with a very sharp knife. You want the potato slice to be so thin that you can see through it a little. When the oil is ready, drop the potato slices in. Fry until the edges begin to turn golden brown. Shake the excess oil and dump chips into a brown paper bag filled with a teaspoon or two of Old Bay. Close the top of the bag and gently shake to season chips. Remove from bag and place on a paper towel in a single layer until you are ready to garnish your soup. Wow, this looks fabulous! 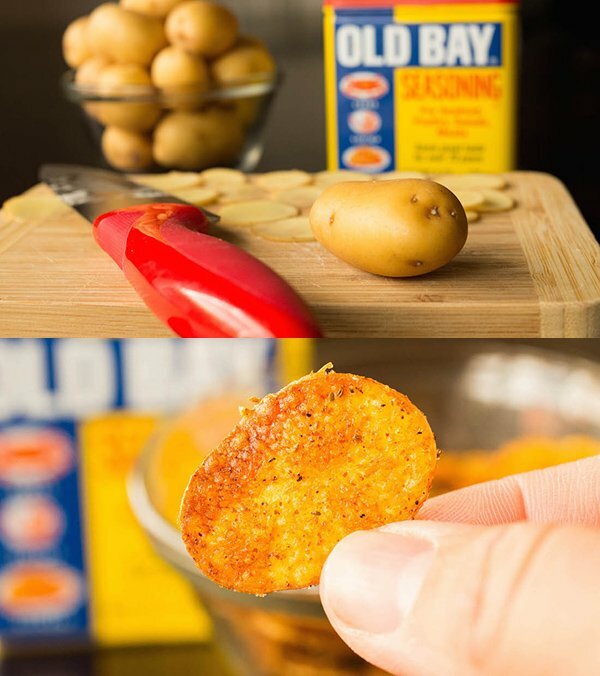 Love the idea of the Old Bay chips. Definitely gonna try this one. As a Pacific Northwesterner we have it good here! 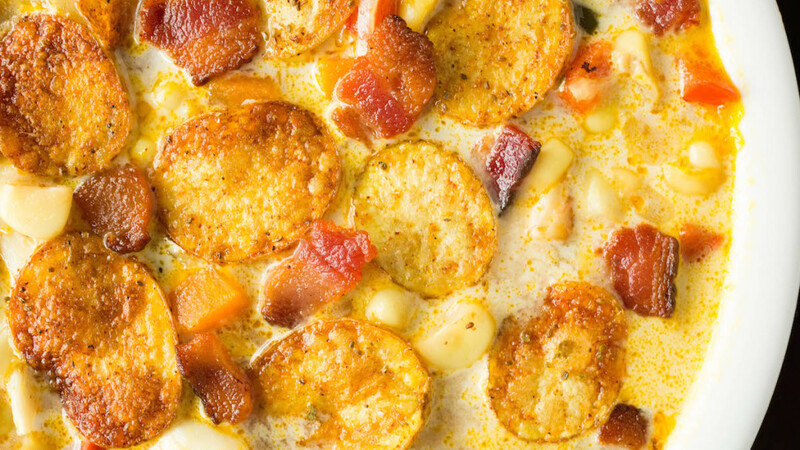 I really like your addition of Old Bay Chips to this recipe. It gives it a little bit of a kick.